Are you ready to know about what is up milling? What is down milling? What’s the exact difference between up milling and down milling? So, don’t worry. 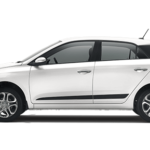 You will get exact answers of all these questions in this article. Let us first start with the definition of milling. Basically, milling is a cutting process where we use a cutter to remove the material from the surface of metal or workpiece. This cutter which we use has multiple rotating cutting surfaces. 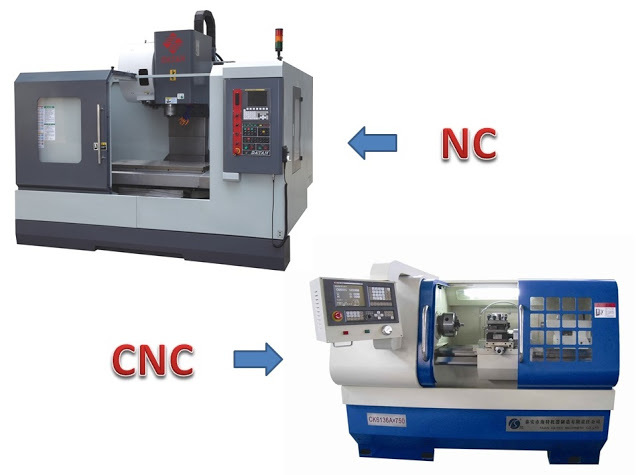 In milling process, there are two separate ways by which we can achieve cutting of materials from the workpiece. 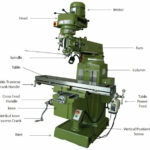 The first method is called as up milling and the second one is down milling. The fundamental difference between these two processes is the direction of rotation of cutter relative to the feed motion. Here, the cutter is in rotational motion while the feed is in linear motion. Also, the point to note here is that the material or metal is removed in the form of small chips. 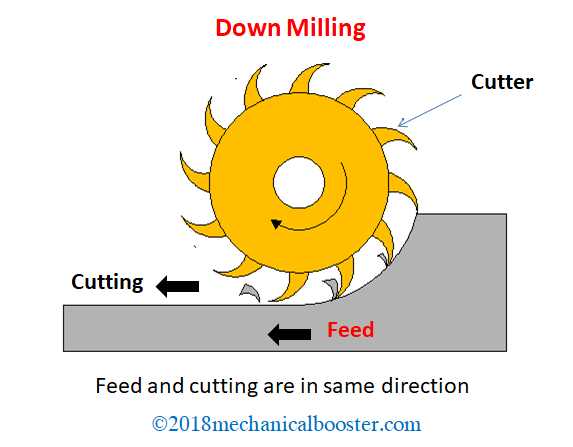 In case of down milling, the cutter rotates in the same direction as that of the feed. You can see that, in down milling there is less friction involved between the cutter and the workpiece as both i.e. cutter and feed are moving in the same direction. This small amount of friction results in generation of minimum heat. 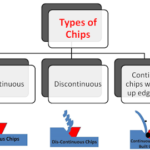 Here, the thickness of the chip varies from maximum to minimum during the process. 1 Up milling is also termed as conventional milling. It is also called as climb up milling. Down milling is also called as climb down milling. 2 The rotary cutter moves against the motion of feed. The rotary cutter moves in the same direction as that of the feed. 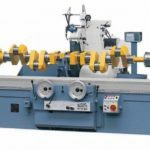 3 Here, while cutting the workpiece from right to left, cutter rotates in anti-clockwise direction. In down milling, while cutting the workpiece from right to left cutter rotates in clockwise direction. 4 The material from the surface or cutting chips are thrown in the upward direction that’s why it is called as up milling. 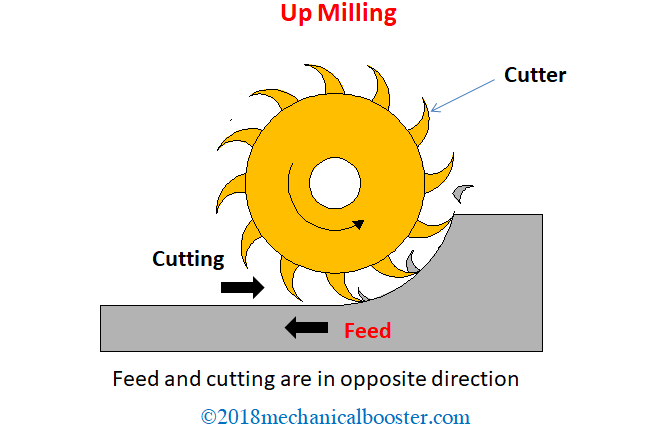 Here the situation is opposite to that of up milling as cutting chips are removed in downward direction and therefore, we called it as down milling. 5 It requires a large amount of force compared to down milling. For down milling, there is a requirement of less amount of force. 6 In up milling, you will get poorer finish. Here, you will get the best surface finish. 7 The chip width increases from zero and then increases as the process goes on. Chip width changes from maximum to minimum value. 8 Up milling is mostly used for rough cutting operations. Down milling is used for finishing operations. 9 Tool wear rate is more as the direction of rotary cutter is against the feed. 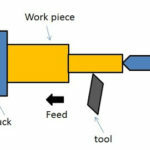 Tool wear rate is less as the direction of cutter is in the same direction as that of the feed. 10 Due to increasing tool wear rate, there is reduction in tool life. Due to reducing tool wear rate, there is enhancement in tool life. 11 It is also famous as traditional way of cutting the surface. Nowadays, down milling is a better choice than up milling. 12 The cutting forces acts upward. The cutting forces acts downward. 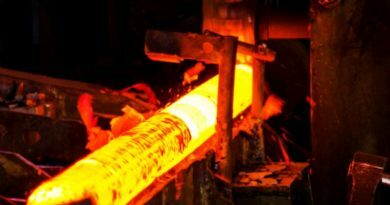 13 It is mostly used in the cutting of brass, bronze and ferrous materials. 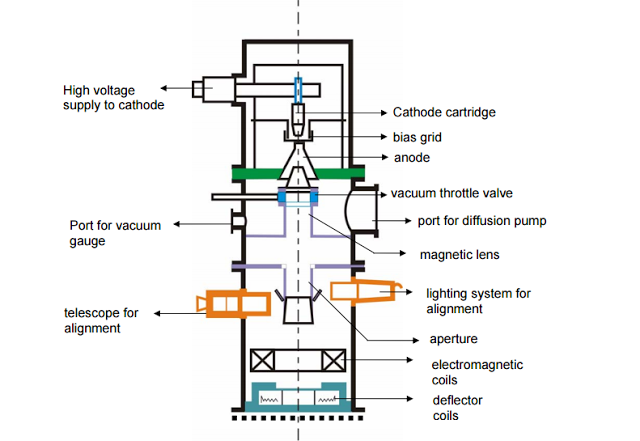 It is mostly applicable to aluminium and aluminium alloys. Which Process We Should Choose: Up Milling or Down Milling? Finally, the question arises in our mind that which process is beneficial? Up milling or down milling? Down milling is a better choice than up milling as we get the best finishing surface as well as there is less heat generation. But in some exceptional conditions you have to use up milling. 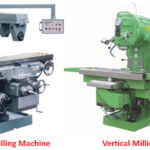 In this article, we have learnt about the difference between up milling and down milling . Hope this article will help you. Share this article if it really worked for you. Because sharing is caring.